Think you can still do the program on your own? Time and Time again, other vendors and even some companies have made the statement "We can do what DeliveryMaxx does". However, there is a reason our program is being reviewed by the United States Patent Office, and it is because nobody can do everything we do the way we do it achieving the results we achieve. 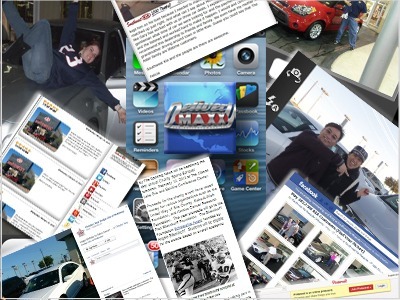 The reason is because DeliveryMaxx has INVENTED this PROGRAM utilizing our knowledge of the dealerships and business processes, marketing and advertising principles, knowledge of consumer behavior, and expertise of Information Technology. These are 3 crucial pieces that serve DeliveryMaxx and our clients well. This is hard work, and although some of the items on the list can be accomplished by another vendor or even a company level- No one has been able to replicate DeliveryMaxx's proprietary program or the results we have accomplished. Many have tried, and many will, but they have all failed. By the time someone thinks they are close- DeliveryMaxx will have already identified the newest technology and adapted our program to meet the challenge. DeliveryMaxx has already submitted patents on technology that hasn't been publicized today. The secret to our success is we have real people doing real work on a daily basis and have written the code for our people to accomplish these results. DeliveryMaxx is "Social Media's Answer to Customer Engagement & Online Reputation Management". We look forward to the opportunity to providing your company with outstanding results and adding you to our list of happy clients. 1. Take a photo of every customer in the correct format. 2. Size the photo to meet every social media and review sites requirement. 3. Brand every picture with the companies name logo address phone number and website with every picture. 4. Email the picture to every customer after the sale or service, 1 & 2 years after the sale, on the customers Birthday, and during the Christmas Holidays. 5. Write a personal email to each customer thanking them for their purchase with the link of the picture increasing REAL Facebook likes and helping the customer share the photo with their friends and family. 6. Create Customer Engagement encouraging conversations about the company on ALL of the Social Media Sites- Not just Facebook. 7. Tag the customer, company, and sales person in each photo. 8. Ability to Code each image published by company increasing SEO value. 9. Collect a Review for every customer. Monitor All of the Review Sites. Direct Customers to the Review sites hoping they will put a good review on each site. 10. Create an alert for each review site to let the owner/manager know a review was made. 11. Respond to each review both positive and negative. 12. Ability to alert manager of a bad review Before Customer Leaves the company. 13. Post a picture of the customer on the website with the review. Making sure that the picture and the review is indexed by the search engines. 14. Write a 250 words or more original blog two times a week creating backlinks citations and mentions of the business while making the article relevant to current events (not to mention a good read). 15. Post a minimum of 3 ORIGINAL items a day on all of the social media sites (without creating duplicate content). 16. Promote blogs and postings on "Out-Of-Network Sites". 17. Post the same picture & Review on all of the Social Media Sites (Without Creating Duplicate Content). 18. Complete all of the information (exactly) with each social media site having them talking with each other. 19. Post videos, but not just to Facebook. Create opportunities to have them populate on blog sites as well. 21. Have Press Releases index through the network without creating duplicate content. 22. Push Press Releases outside the network. 24. Continue to fix duplicate listings when they come up (and they will). 26. Have the ability to adjust as technology and algorithms change. 28. Update any information immediately as needed on the entire network of sites. 29. Combine a Social Marketing Program with a Reputation Program. 30. Ability to teach/train the company's personnel the importance and "What’s in it for me factor". 31. Create Service Special Customer Conquest Programs while implementing them on all of the Social Media and Local Sites. 32. Ability to put "marketing legs" on TV commercials & Radio Spots (without creating duplicate content). 33. Know the use and functionality of each site and understand when, why, and how they continue to change. 34. Monitor all of the social media sites, and strategically direct program optimizing all sites. 35. Understanding each sites rules and regulations keeping the business in good standing with each of the review and social media sites. 36. Ability to compile complete analytics for each site and explain to managers understanding how these affect the business. 37. Understanding of the Push-Out versus Pull-In Approach and capability of creating social media and review network that provides these results while being able to make adjustments on a daily basis. 38. Direct everything that is published to the businesses individual website. 39. For Company Groups; have the ability to conduct all of the above on an original individual basis for each entity in the group (without creating duplicate content). Just reading this list is exhausting. If you read this list in its entirety; you are ONE of the FEW. Now try to do the list on a daily basis. That is where DeliveryMaxx comes in. We enjoy doing this because that is what we are experts at which allows you to focus on what you do best for your company.